ETUDES HAVE NEVER BEEN SO MUCH FUN. The right etudes learned the right way with the emphasis on the HOW and the WHY, not just the WHAT. 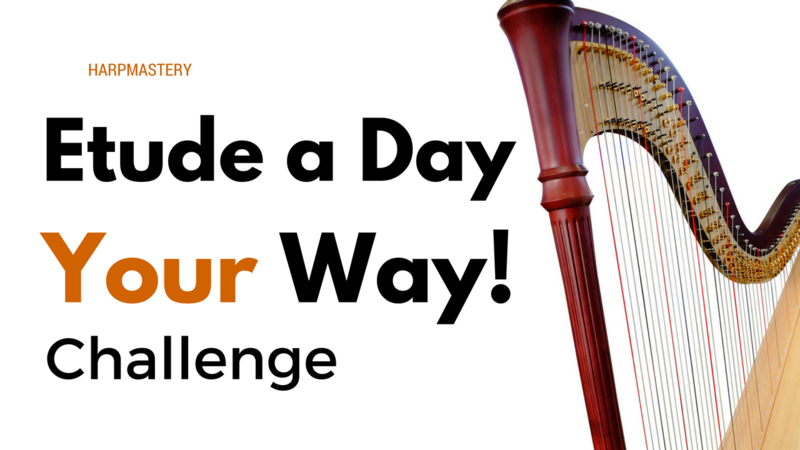 Etude a Day Your Way walks you through an entire etude book - 25 etudes in all - with a difference. You won't just be practicing techniques. You will be learning what the essential skills are behind the techniques, how to practice them and how to go beyond the notes and actually make music with them. What does this mean for you? to play the music you want. Ps. Want to see a sample? See the Etude 1 lesson by clicking here. Harpist Anne Sullivan began her concert career at age twelve when she appeared twice as soloist with the Philadelphia Orchestra. She is known nationally as a recitalist and chamber musician, performing regularly with SPARX flute and harp duo, Duo Parisienne violin and harp duo, and the Easterly Chamber Players. She is harp instructor at the University of Delaware, and she is founder and director of Harp in the Mountains Summer Festival. Ms. Sullivan has released two solo CDs as well as four chamber music recordings. She enjoys helping harpists worldwide through her online membership program at Harpmastery.com, which currently has over 75 students enrolled from around the world. There are over 75 videos in this course - three for each fo the 25 etudes, plus a few extra! I introduce and explain the concepts for each etude, and then I play the etude for you twice, once at a faster and once at a slower tempo so you can see exactly what to do, or play along! PLUS...Exclusive review lessons that help you put your new skills into action. PLUS...PDFs of each etude in two different keys (so you lever harpists can join the fun!). PLUS...Access to a private Facebook group where you can share the journey with other Etude Challengers. And because you have access to the entire course as soon as you sign up, you can move through the etudes at whatever pace suits you and your schedule best.